So I had huge plans for Berlin. We started with my most favourite of touristy things to do and that was the free walking tour. Yes, free. They rely on you tipping at the end. I did this same tour last time I was in Berlin and enjoyed it enough to want to do it again. 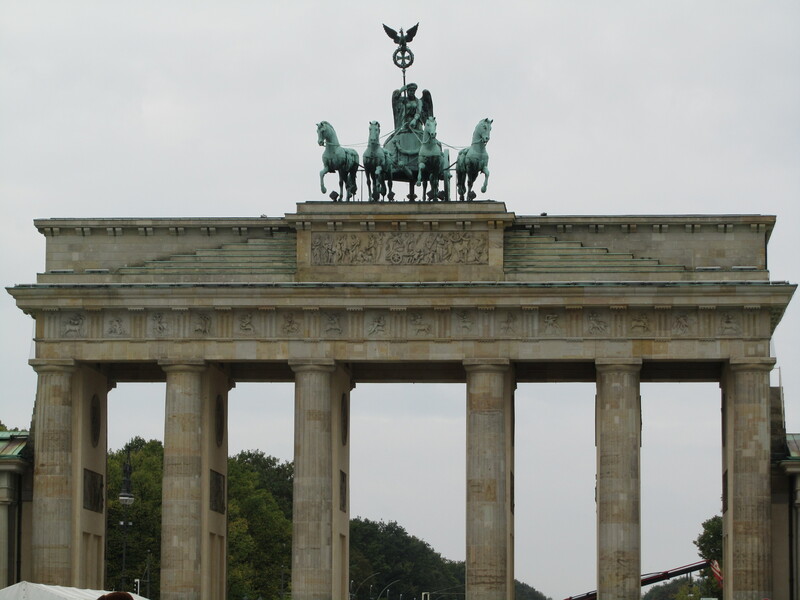 It also helps because we got a different tour guide who emphasised different parts of the Berlin story. Plus, things I didn’t get or struggled with in terms of timelines, made more sence this time. She took us around to all the important places such as Paris Square, Brandenburg Gate, Tiergarten, the Memorial to the murdered Jews of Europe, off to Checkpoint Charlie, one of the remaining places where the wall still stands, the sight of Hitlers bunker, the sight of Hitlers book burnings and finishing off on Museum Island and the story of how the wall fell. It was a really good tour with our guide, Amy, throwing in plenty of really bad jokes to make it enjoyable. After the 4 hour tour, (!) 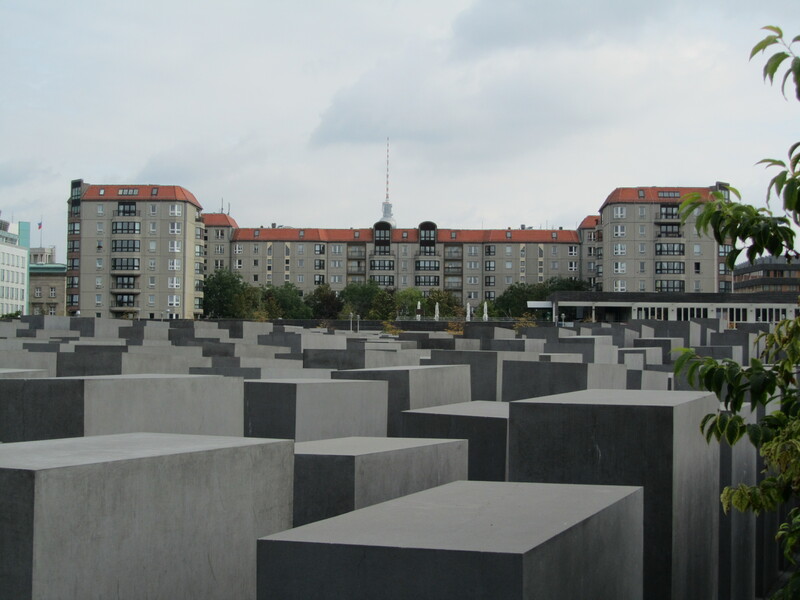 we went back to the Jewish Memorial as that is one of my favourite sights of Berlin. Underneath the memorial is a museum, dedicated to the Jews killed in the war, which gives a far better understanding of what it was like being a Jew during the Holocaust. The museum is split into different rooms, each focused on one aspect. The first room is a timeline of the events relating to the Holocaust starting in 1935 and ending in 1945. The second room is filled with segments of dairy/journal entries and letters from people caught up in the Holocaust with a little description of each of those people. Who they were, where they came from and what became of them. The next room was filled with whole family experiences. They had 16 families on ‘display’. They would say what each of the people did before the war, what they did in reaction to the Nazis coming into power (most couldn’t do anything without losing everything anyway) and what became of them when they were caught. The third room was just a plain, dark room with a voice reading out the names of people who died in the Holocaust, with dates of birth and death and a brief description of there lives. Apparently it would take 7 years, 6 months and 24 days to go from the start to end. The fourth room was about individual camps. Where they were located, when it was in operation and how many people were imprisoned and died there. In the final room, there were a bunch of computers that you could look up the details of any individual person that died in the Holocaust. Also they had all of the concentration camps listed for further exploration and more. This museum is just…. great/haunting/interesting/sad/different/tiring/morbid but most of all perfect. After we left the memorial, we finished up our day with shopping, eating and sleep. Like most days.